With a nationwide opioid epidemic upon us, states are starting to insist that prescribers conduct a bit of research before writing prescriptions for addictive medications like pain medications or benzodiazepines. States have therefore created statewide Prescription Drug Monitoring Programs (PDMPs) to monitor an individuals’ controlled substance dispense trends which are meant to assist a prescriber in making smarter treatment decisions. The goal here is to check a patient’s medication history to determine if the patient is doctor shopping or if they may have potential complications with medication(s) they are taking or have taken. Ultimately, PDMPs aid a prescriber in understanding the risks involved in prescribing these powerful medications for their patients. In most states, healthcare professionals who prescribe at least one controlled substance are encouraged, not required, to use PDMPs. The USA Today article addresses the fact that only five states promote the use of PDMPs and less than 20% of doctors use the databases when it isn’t required. On the other hand, e-Prescribing of controlled substances has proven to be an effective tool in combating this crisis, yet only three states have mandated the use of e-Prescribing, and one doesn’t enforce its own law. All 50 States (and D.C) have now passed legislation allowing the e-Prescribing of both controlled and non-controlled substances, which is a drastic change from only a few years ago with federal regulations prohibiting the e-Prescribing of controlled substances. New York: The first state to mandate and enforce its e-Prescribing laws as of March 2016, New York requires prescribers to check their state PDMP database and prescribers who continue to write paper prescriptions are subject to fines, jail time, or both. Since implementing, total numbers of opioid analgesics prescribed fell by 78%. 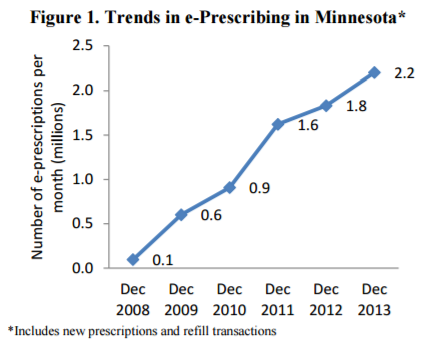 Minnesota: Technically the first state to deploy mandatory e-Prescribing, they currently do not enforce the use of such technology. The MN Department of Health recently reported that drug overdose deaths jumped 11% between 2014 and 2015 and more than half were related to prescription drugs, specifically opioid pain relievers, rather than illegal street drugs. Minnesota Health Commissioner Dr. Ed Ehlinger said, “The new data show the need for a broader approach to addressing the root causes of drug addiction and overdoses.” Stay tuned. Maine: Experiencing one of the highest death rates in the country due to opioid overdose, Maine recently mandated e-Prescribing for schedule II controlled substances and will be put into effect come June 2017. Similar to New York, prescribers will face fines, jail time, or both if they choose to utilize paper prescription pads. New Jersey is also on the horizon to mandate e-Prescribing in due time. As a collective nation, we can no longer sit back and overlook the link between opioid overprescribing and opioid overdose. E-Prescribing and PDMPs should work hand in hand; the benefits are exceedingly visible and with 3-9% of opioid abusers using forged written prescriptions, it’s a commonsense solution. Protect your company, protect your providers, but more importantly, protect your patients. They depend on it.